Encourage students' experiences with academic vocabulary building exercises with this downloadable, printable grammar vocabulary puzzle. Suitable for the homeschooled classroom as well as students in middle grades 7,8,9. Students solve the grammar cryptolist puzzle by substituting one letter for another. 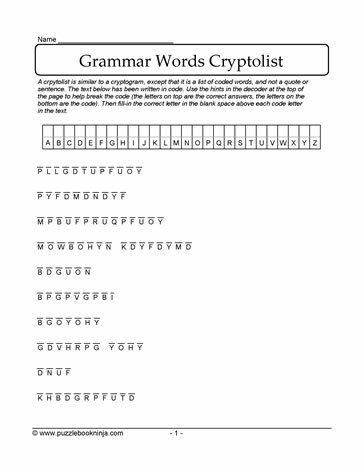 Students need to decrypt the letters. Use the table to keep track of the letter substitution. Engage students' problem solving skills through knowledge of letter pattern recognition, knowledge of grammar vocabulary, and making connections between the two. Cryptolists and cryptograms stimulate brain activity to reinforce old connections and help to develop new neural connections.